Facebook have revealed their first attempt at integrating the social network’s platform with virtual reality in an effort to give users a new way to hang out with their friends. 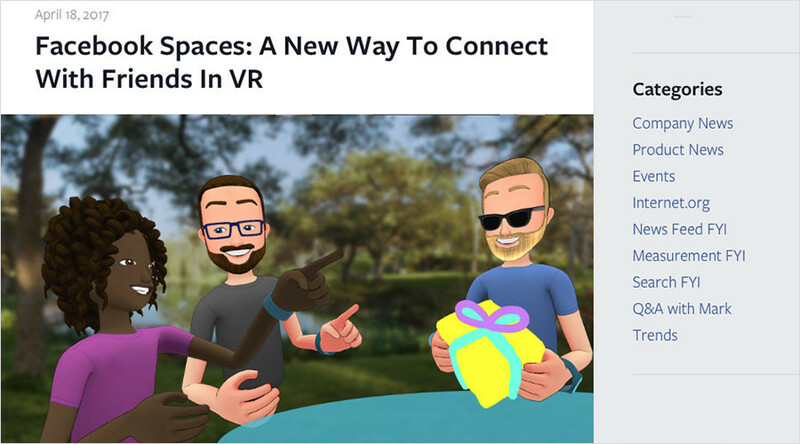 “Facebook Spaces” was unveiled at the company’s annual developer conference on Tuesday. It will allow those who own virtual reality headsets to build personalized cartoonish-looking avatars from their recently tagged photos. In the chats users can look at 360 degree videos, chat, draw and show off pictures in a virtual reality slideshow. Rachel Franklin, head of social VR at Facebook, pointed out that people find the experience very real. If your avatar takes a selfie, you tend to smile in real life too, she explained. She illustrated this point by telling the audience about a slight malfunction in the software that cropped up during trials. The glitch caused people’s avatars to continuously hold hands with each other. Despite it not being real it still caused the users to blush and a man said he’d have to go home and tell his wife that he’d been holding hands with another woman. Facebook has pumped serious investment into virtual reality, most notably its $2 billion purchase of virtual reality technology company Oculus Rift in 2014. In October last year the company announced another $250 million investment in the technology. Spaces will initially only be available on Oculus Rift headsets, however it will later expand to other VR platforms. The software, which is in beta, is open to software developers to modify. The app is available for free download in the Early Access section of the Oculus Store. Speaking at the conference, Facebook CEO Mark Zuckerberg also offered his condolences to the family of Robert Godwin, Sr. whose livestreamed murder was posted on Facebook for more than two hours on Sunday.